Hosting experiences come in all shapes and sizes. We plan and pray, but the reality is the Lord’s…and it is always far better than what we could have imagined. Our first hosting was in the summer of 2011. And it was… ok. Not great, not bad. Just ok. But overall, it went well enough that we knew we wanted to host another child the following summer. When the winter photo-listing was released, we of course poured over it. We would look at photos, read bios, and pray for the kids on the list. We would check back every so often to see who went on hold and whether any new kids were added—but never with the intention of looking for someone to host. However, as He usually does, the Lord had other plans. We “stumbled” across a photo of “M”, a teenage boy. Well, a man, really. I wish I could say I embraced the idea of hosting a teenager right away. But I didn’t. Our children at home (both boys) were at the time, 7 and 5, which is a FAR CRY from teenagerdom. But the Lord kept nudging. I ignored it for a while. Oh, I had LOTS of excuses. But they amounted to very little. We kept feeling the pull, and chose to host “M” that winter, and it was fantastic! 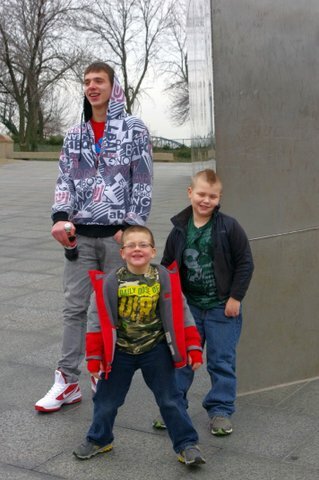 He was great with my kids! He played soccer with them, made cup towers and domino courses, and took a 2,500-mile road trip like a champ. Yes, he slept a lot, and he ate a lot (though nothing green), and he was AMAZED that you could get free refills and all the ketchup you wanted at Wendy’s. He brought us a Christmas present from his country and we were able to bless him with gifts as well. We walked through Google maps together and “M” showed me where he lived, as well as pictures of famous landmarks in his city. I learned about Christmas and New Year’s practices from the other side of the world, and he experienced some of our quirky family holiday traditions. “M” was nearly fluent in English, but we learned (and butchered) bits and pieces of his national language as well. It was an AMAZING 4 weeks, and it went by way too quickly. We’ve kept in touch since then, messaging back and forth on social media, keeping track of what was going on in each other’s lives, birthday gifts, Christmas gifts, etc. It’s been a joy to be able to maintain that relationship, even though he’s 5,000 miles away. “M” was set to “graduate” the summer of 2014. And that spring, over Facebook, he asked if we could come to watch him graduate. We couldn’t all go, but I could. And so I did. At the heartfelt request of my host son from 3 ½ years before, I flew to Eastern Europe to watch him graduate. I couldn’t understand a word of the ceremony, but that didn’t matter. I didn’t know any of the traditions or customs (by the way they don’t play Pomp and Circumstance), but that didn’t matter either. I was there. Supporting him. Encouraging him. Cheering his accomplishment. Doing what family does. It was an experience I’ll never forget. 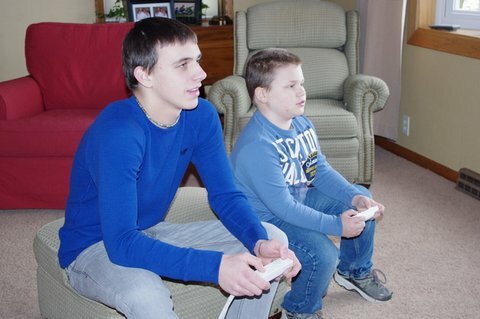 People are often hesitant to host teenagers- especially teenage boys. I get it. I was there, too. They’re like a different species, sometimes. And if you don’t have experience with teens, well… the very idea of having one in your home can be intimidating. But oh, what I would have missed if I’d let my fear and worries guide my decision. You’ll often hear host parents say that they went into hosting to be a blessing to a child in need, but that they came out of the experience as the ones who were blessed. Truer words were never spoken, and I have an extra stamp in my passport to prove it. Don’t discount those older kids on the photo-listing. They are blessings just waiting to happen. Interested in hosting a teen boy or another child this summer? If you have not already signed up for the photolistings you can do so here and your regional coordinator will contact you to answer any questions you may have. Marty and her husband have two children and are three-time host parents. 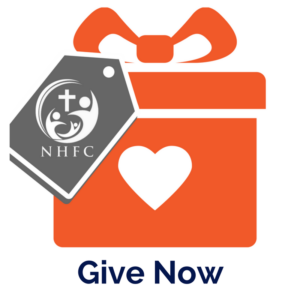 Marty began volunteering for NHFC in 2012 and currently serves as Board chair.